Business drinks at the Daily Planet will never be the same thanks to this official Superman suit from OppoSuits. We can’t say for sure if this suit will give you actual superpowers but we do guarantee that it comes with a super strong look! Included in the pack are a fully lined jacket with right breast pocket, matching trousers with a zip and button fly, , and a matching tie all packaged in a stylish and sturdy box to make sure it reaches you in tip top condition. All you need to add is a shirt and shoes. These suits from Opposuits are fantastic for all sorts of occasions such as general fancy dress parties, dinner parties, club nights, sporting events, stag parties and more! This suit would also be great for comic conventions or other comic book themed event. OppoSuits are available in the standard UK suit sizes ranging from 36 to 52. However, we strongly advise you to take some time in order to measure yourself, or have someone else measure you up to ensure you get the correct size. Holding your breath whilst wearing an OppoSuit is an option, but far from ideal. Identifying your chest size should be achieved by measuring at the widest part of your chest with a tape measure. 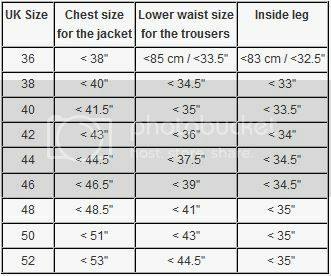 Measuring up your chest size is the most important part as it is essential to get the right size jacket. Identifying your chest size should be achieved by measuring at the widest part of your chest with a tape measure. The lower waist is measured around the part where you normally wear suit trousers, just three fingers below the height of your belly button. Click the button below to add the Opposuits Superman Suit to your wish list.